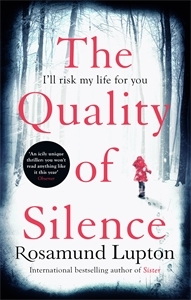 FilmNation has set its sights on British author Rosamund Lupton’s latest best-selling novel,The Quality of Silence. The production, financing and sales company has optioned film rights to the book, which hit stands in the U.S. last month following its publication in the U.K. in summer 2015. The female-centric story, both a psychological thriller and an investigation of motherhood and marriage, tells the story of a mother and her 10-year-old deaf daughter who embark on a treacherous journey through the Alaskan wilderness in search of the woman’s husband. The hunt for a director and writer is currently underway. FilmNation was also involved with Room, another tale of female empowerment that was nominated for an Academy Award for best picture and won Brie Larson the Oscar for best actress. Glen Basner’s FilmNation continues to ramp up its in-house production efforts, in addition to remaining a leading foreign sales company that’s known for attracting top directors. Other FilmNation productions include The Founder, the upcoming biopic starring Michael Keaton as McDonald’s mogul Ray Kroc. Lupton’s best-selling debut novel, Sister (2010), has sold more than 1.3 million copies worldwide and been translated into 30 languages. The acclaimed book spent time on the New York Times’best-seller list and was the fastest-selling debut novel in WH Smith’s history in the U.K.
Sylvie Rabineau at RWSG represented the film rights and negotiated the deal with co-agent Felicity Blunt at Curtis Brown UK. By Pamela McClintock. Read the article here.